These networking skills training course materials will help your participants build a professional reputation and develop a network of connections through the two key methods available to them; face-to-face and online. They will discover how to effectively combine these two approaches and create a strategy for networking success that will generate their own community and actively grow their personal network. This will result in an improved performance in their approach to networking and consequently provide opportunities and prospects that will increase their business success. The training provides them with the tools and techniques to both plan a successful, strategic approach to networking and develop their personal communication skills, which will ensure they build effective business relationships. 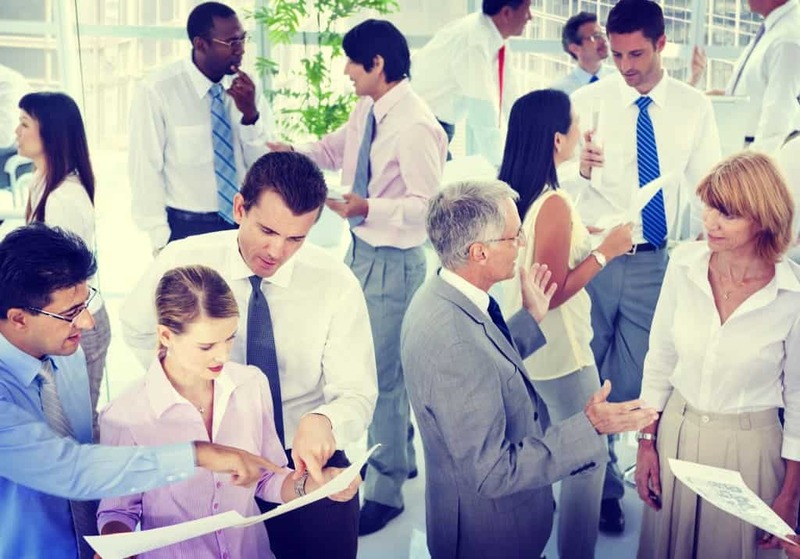 Networking has become a crucial factor in the modern workplace. It is the most effective method of developing your business or career and is a key component of your personal brand. You need to be able to build strong business relationships, develop a level of personal credibility and increase your network of contacts in order to enhance your visibility and create opportunities for yourself and your organisation. Perhaps you’re looking to improve the networking performance of a management or sales team. Or you want to include networking skills training as part of management and leadership training programme. Whatever your need, Trainer Bubble provides you with a comprehensive networking skills training course to make your life easy. These business networking training course materials are aimed at helping participants develop their business or career. They will help ensure they have the skills, knowledge and techniques to develop a joined-up networking strategy that gets them the outcomes they want. Participants will also be encouraged to develop the correct behaviours and attitudes to help build their visibility and credibility through networking so that they develop strong working relationships that last. Why Network? – Establishing the importance of networking with some shocking statistics and an activity that defines the importance of networking to the individual. This is followed by some insight into the key aims of a networking strategy, what puts people off as well as some personal revelations about networking. Increase Your Business Presence – Looking at the components of a strong business presence, including; credibility, personal brand, visibility and social capital. 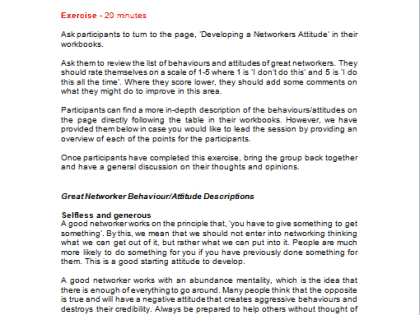 Developing a Networkers Attitude – An exercise that clarifies the perfect attitudes and behaviours of great networkers and comparing the participants against this. Thus identifying areas for development. 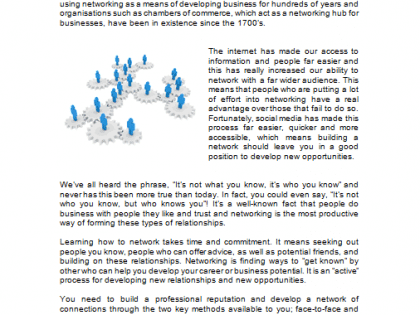 Face to Face Networking – An overview and insight into the main types of face to face networking opportunities available with the benefits and pitfalls of each. 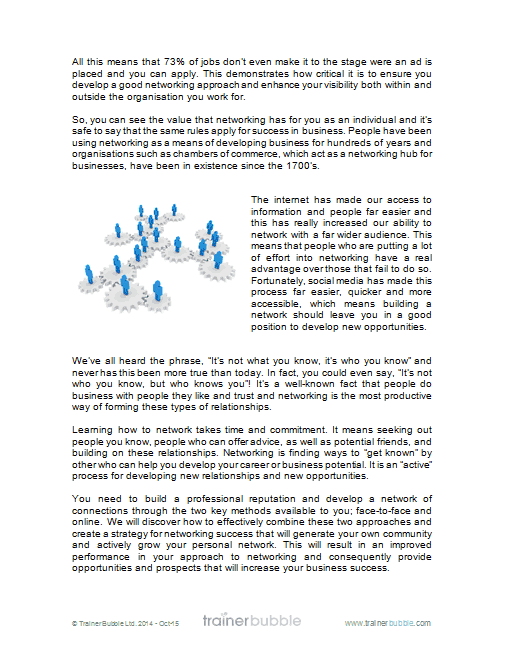 Online Networking – An overview of the different social media and online networking tools and how to get the best out of them. Includes; LinkedIn, Twitter, Facebook and online forums. Communication Skills for Networking Success – Ensuring a good first impression, creating an opening sound bite and writing an online profile that promotes and engages. 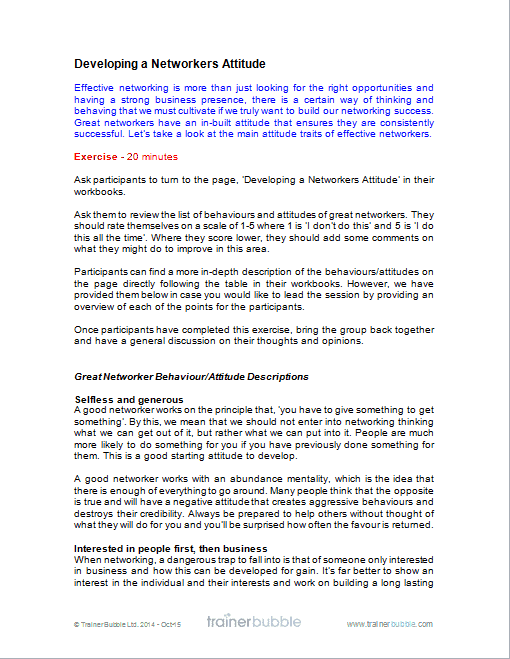 Developing a Conversation – Building on the opening sound bite and developing a conversation through good questioning techniques and following a selection of key networking rules. Including an activity to test and practice the skills. Working a Room – A fun activity that embeds and develops learning while encouraging practice and communication. This activity covers 10 of the main skills required to work a room. Breaking into a Group – Identifying body language to spot when a group or pair is open to new people entering the conversation or would rather not encourage participation. Knowing how to break into a group, what to say and how to remain professional. Exiting a Conversation – Developing some techniques to extricate oneself from a conversation without causing embarrassment or rudeness. The Follow Up – Using a structure to identify the most important contacts created and establishing when and how to follow up with each group. 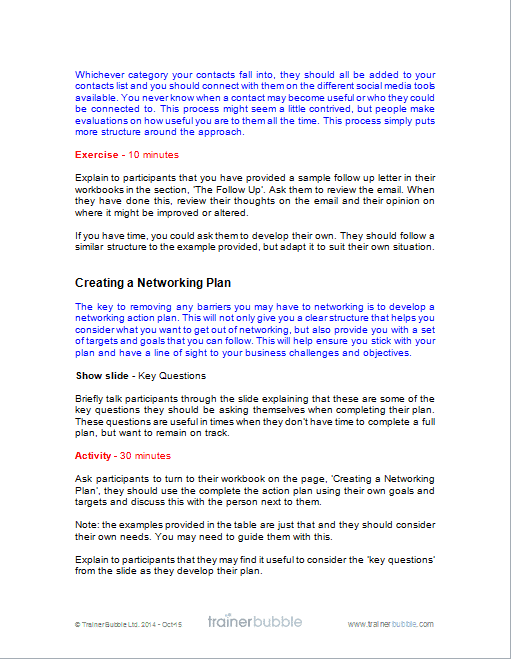 Includes example follow up email and a chance to develop their own. 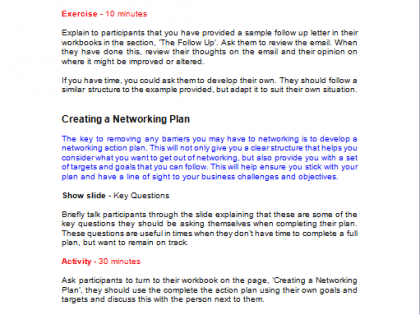 Creating a Network Plan – Participants are provided with a networking action plan to review and complete. This sets them on the journey of developing their networking skills and ensures they have a strategy and goals to target. As with all Trainer Bubble training course materials, this training course is highly interactive and includes lots of activities and exercises to stimulate discussion and develop learning opportunities.